There’s something very special about the Lowcountry lifestyle that defines coastal South Carolina. Lowcountry is more than a geographical region, it’s a unique way of living with a culture and cuisine all its own. It’s part of what makes a vacation at Palmetto Dunes so special, and it’s worth cultivating all year long! Now that your summer vacation on Hilton Head Island has come to a close, and while you start planning your return trip to Palmetto Dunes, embrace our Lowcountry lifestyle with these easy tips. Embracing the Lowcountry lifestyle is all about taking the time to enjoy the small things in life. It’s easy to stop and enjoy a stunning Hilton Head Island sunset or wake up early for a sunrise stroll on our white sand beaches while you’re in “vacation mode” at Palmetto Dunes, however, our busy lives and hectic schedules often push us through the day without so much as a pause. Similarly, there’s nothing more pleasant for a local resident than a few quiet minutes sitting on a front porch. In fact, some residents would tell you it’s best to spend an afternoon just relaxing and enjoying the slow pace of life we have here on Hilton Head Island. Cultivate the appreciation you feel while in the Lowcountry. Wake up a few minutes earlier to look out at the sky and take a deep breath. Enjoy the simple pleasure of that first sip of coffee in the morning. Take a walk after dinner and leave your cellphone at home. It just takes a few minutes’ pause to enjoy life’s small moments and feel as relaxed and laid back as a warm southern summer breeze. We think you’ll agree that the natural surroundings of Hilton Head Island are truly spectacular. Hilton Head Outfitters makes it easy to bike along the island’s white, sandy beaches and oak tree-lined streets, or paddle along the Palmetto Dunes lagoon system and other coastal inlets and estuaries. But just because you’re not enjoying all of the outdoor activities Palmetto Dunes has to offer doesn’t mean you can’t get out and enjoy nature in your neighborhood. Find a local park to visit on the weekend, or even take the time to enjoy the shade from a tree-lined boulevard in your town. If you really want to surround yourself with the natural scenery of the Lowcountry, place a photo or piece of local art on your wall, so an escape to Hilton Head Island is a mere glance away. There are some incredible art galleries and artisans’ shops at Shelter Cove Harbour and Marina, so be sure to stop in on your next Palmetto Dunes vacation to pick a Hilton Head view to call your own. Serve up some Lowcountry cuisine. South Carolina Lowcountry has a unique cuisine with influences from North Africa, the Caribbean, and traditional Southern and Native American dishes. Inspired by the area’s agricultural history and coastal landscape, rice and seafood are staples found often in Lowcountry dishes. There are plenty of ways to sample Lowcountry flavors at Palmetto Dunes. 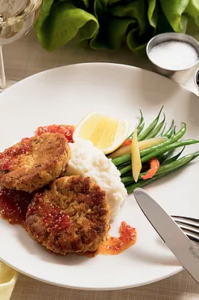 Try traditional shrimp’n grits or good old-fashioned Southern Barbecue at Big Jim’s, or head to Alexander’s Restaurant for Lowcountry crab cakes. End a day of exploring, shopping, and entertainment at Shelter Cove Harbour with gumbo and fresh oysters at Scott’s Fish Market or a decadent seafood entrée at Ela’s Blu Water Grille. We know you’ll be yearning for Hilton Head Island’s Lowcountry fare, so why not embrace the Lowcountry lifestyle by indulging in some fresh seafood every now and again, or adding ‘peas and rice’ as a side dish at your next meal? A key ingredient of Lowcountry cooking is a casual approach. It’s all about good ingredients and sharing a meal with good friends. Get inspired by Lowcountry Architecture. You may have noticed while biking around Hilton Head Island, that many of the houses have an architectural style all their own. This Lowcountry style of architecture dates back to the 1700s, and its features are rooted in practicality. Many homes are made of timber and constructed on pillars to keep the main floor away from rising tides, storm surges, and swampy land. Broad roofs and large, covered front porches are another signature of this style. Some of our rental vacation homes are built this way, and many feature large windows, another Lowcountry architectural signature that lets beautiful views and ocean breezes in, and warm air out. While constructing a new porch may be unrealistic, simple touches of wood, sea-inspired accents, and a classic rocking chair by the window are easy ways to inject a bit of Lowcountry into your home décor. Follow Palmetto Dunes on Twitter or Instagram to see glimpses of life on Hilton Head Island all throughout the year, right in the palm of your hand! Sign up for emails from us, and check our blog to keep tabs on what’s happening at the resort. You can even catch a glimpse of current weather conditions and Lowcountry views on Palmetto Dunes Oceanfront Resort webcams! The laidback atmosphere of the Lowcountry lifestyle is a huge part of life on Hilton Head Island and embracing this lifestyle is a sure fire way to bring some relaxing vacation vibes into your everyday life. Once you’ve embraced it, you’ll be more than ready for your next vacation to Palmetto Dunes.